Want to attract birds & other wildlife to your garden? Just add water (features). Garden Help is dedicated to bringing useful information to the worldwide gardening community. In continuing with this tradition, Garden Help is introducing a few special guest writers who will be contributing compelling information from their horticultural worlds. Arborists, Moss specialists, garden coaches, construction folk, garden artists, and horticultural educators are just a few of the helpful garden coaches you will hear from at Garden Help in the future. If you would like to contribute articles to our blog, please get in touch. Be sure to include links to samples of your writing and to your rights-cleared images; all writers supply their own images to compliment articles, and they must be able to prove ownership of those images. Also, please share a description of your area of specialty, how your expertise differs from and compliments the writers below, and a link to your bio. Be aware that we are not able to offer financial compensation for article contributions. All serious submissions will be considered if they comply with the above requirements, and we will contact you only if we determine your contributions may be a good fit. Thanks! Bob Albert: Bob is the guy at Garden Mentors who measures twice and cuts once. Not only is he our webmaster, but he really is Bob the Builder, and he’s going to help share his knowledge about building things in the garden with us. Bob has done quite a bit of fine woodworking. 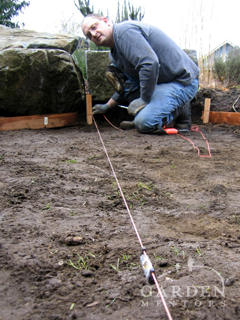 He’s built everything from attic remodels to fences to waterfeatures to trellises. He’s put in patios and muscled multi-ton boulders by hand with his buddies. Plus, he’s quite the assistant winemaker at Domanico Cellars. Beginning with worm bins, Bob will be sharing his experiences in the garden, focusing mainly on construction projects. But, don’t be fooled. This guy has a green thumb, too! Katy Bigelow: As a consulting arborist, Katy Bigelow provides tree services grounded in experience and education gained over ten years in the horticulture and arboricultural fields. Her exposure to a wide range of plants and trees comes from the opportunities to work at world class Arboretums in Santa Cruz, CA, Seattle, WA and Melbourne, Australia. Katy honed her gardening skills as a Gardener for the City of Seattle while completing a degree in Horticulture. She is holds a degree in Arboriculture and is a Certified Arborist through the International Society of Arboriculture (International Society of Arboriculture Certified Arborist # PN-6039A). 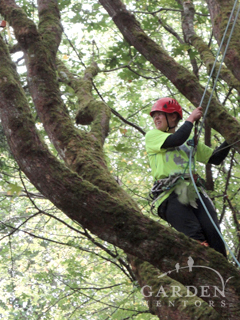 She became certified as a Tree Risk Assessor in 2007 (PNW Certified Tree Risk Assessor # 199) and became a graduate of the prestigious ASCA Academy in 2008. Read Katy’s first Garden Help post here. You may contact Katy at www.katybigelow.com or 206.351.1375. 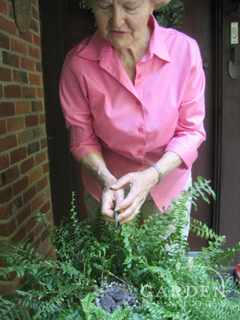 Norie Burnet: For over 30 years Norie has cultivated an unparalleled moss garden in Richmond, VA. This has earned her the much-deserved title of “The Moss Lady”. 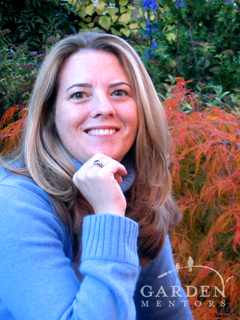 Her gardens have been featured in numerous publications and on HGTV’s Gardener’s Diary. Norie provides group and private tours of her garden upon request. As well, frequently she is invited to give her slide lecture entitled, Celebrating Mosses: A Shade Gardener’s Odyssey, to gardening enthusiasts throughout Virginia and Washington, D.C. (and occasionally other locales). Read Norie’s Garden Help post here. Robin Haglund, CPH: Robin founded Garden Mentors® and Garden Help. She is the primary writer at Garden Help.org. Learn more. Susan Maki: Susan’s love for gardening began as a child while following her dad around plant nurseries. However, it was the scented rose planted outside the front door of her first rented house that ignited her passion for roses. A self-professed rose addict, Susan has tended over 100 bushes at her home in Sammamish, WA. She believes there is a rose for every garden – even ones with limited sun. Susan, a Washington State Certified Professional Horticulturist, completed her horticulture studies at Lake Washington Technical College, and is a now a technical aide for the program, a container designer, garden coach, and mom to three active kids who will occasionally pick up trowel and join her in the garden. Barbara Sanderson: Barbara, founder of Glass Gardens Northwest, was born and lived in Canada until she left for graduate school in the United States. She has been a life long gardener and nature enthusiast. 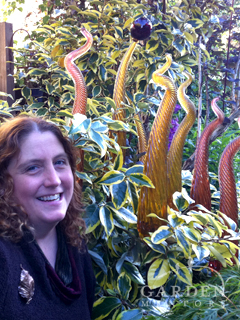 She has been creating nature themed hand blown glass garden sculptures, lights and fountains since 1998. She lives in the Pacific Northwest and loves hiking, photography, cooking vegetarian meals and enjoying her partner and pets.